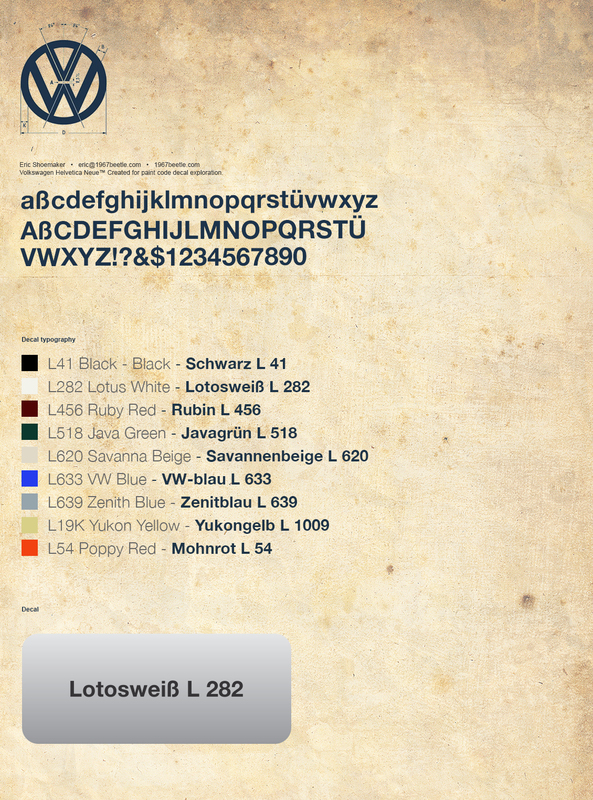 Now available – ’67 Beetle Paint Code Decals. Correct to German factory color specifications, these metallic silver decals were designed and produced exclusively for 1967Beetle.com on a commercial quality printer. They match the original in every aspect. These decals mount under the washer bottle of your vintage pride and joy. Use the coupon code 67PaintDecal at checkout to get 25% off your purchase. (Coupon expires at 11:59 PM PST on 12/31/2013). A lot of research was done to find the correct German color translation as well as typography. You can see a full design study below. 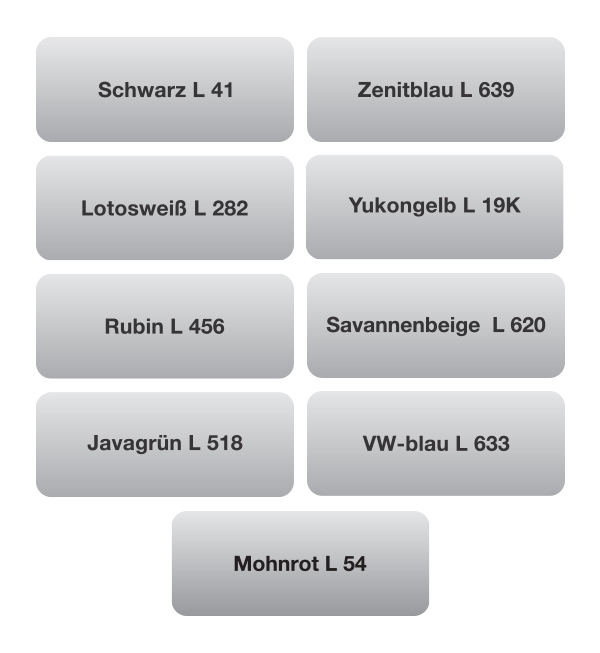 A huge thanks to the ’67 Volkswagen community for their contributions to my research. Thanks so much! Yes, there will be more of these coming in the future for sure. Further research will be needed for each yeah for the German translation. Thanks! I love these old cars. Thanks so much for help with my research as well as supporting 1967beetle.com! I have a silly question. Were there other colors available for 1967 convertibles? I have one, but it’s more of a red/orange color. I call it Poppy Red. We have looked in tight areas to see if it was a color change, but it does not look like it is. It is an original color to the car from what we can see. What are your thoughts? Thanks for asking. I was waiting for someone to chime in and wonder. There were a few colors I left off in the Convertible space, mainly Fontanna Grey and Poppy Red. Yukon Yellow was the only color a ’67 Vert could be purchased; that is, stock from the dealership. From my VW literature, a ’67 Vert could be special ordered whatever someone wanted. However.. So, to longer answer your question, it comes down to cost to produce these and how many I might actually be able to sell. If there is enough demand, I’ll do them in the future for sure. The correct color info for L54 Poppy Red is Mohnrot L 54. Thank you for your speedy reply. If you get enough interest in Ruby Red paint labels, I would love to buy one. We’ll see what happens. ooops I meant to say Poppy Red! Not Ruby Red. sorry! with the closest color paint to the original he could find. 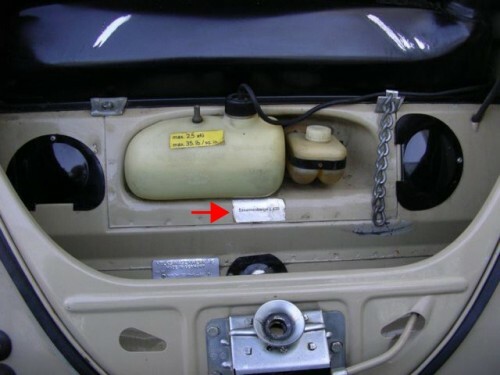 In working on the car, we searched where the top hardware attaches and deep in the nooks and crannies and could only find the Poppy Red color anywhere. So, yes, the decal is gone for whatever reason. I suppose my car could have been a special order. Now I am really curious, so I think I will order a birth certificate. Keep you guys posted! No problem. I was just getting information from my vendor about the cost to produce both of the decals I left out. I’m sure more will chime in, so I’ll more than likely be producing these in the very soon future. I signed you up for the ’67 Beetle alerts, so you will be notified as soon as they are for sale. Thank you for the support of 1967beetle.com. Here is an original Poppy Red ‘vert Rachel. Is this what your color looks like? Identical to my ‘vert!! I don’t have whitewall tires tho! Thank you all so much. After further research, I will in fact be producing the Poppy Red paint code decal as it was a US color. They will be available on the store within a week. Why don’t we feature your ’67? ok! let me round up some pictures and write up a little story. We would love to feature your ’67! Hi love the web site … I was wondering if Fontana grey was a color for the 67 sedan? Thanks! It is, but not for US spec ’67 Beetles. In the future, I might produce this color depending on the market demand. Thankyou … I have a project that may have been black (it has been stripped by the PO).. because the flaws (and there are a few) would show up so much I was looking for a lighter color that was a 67 color. The int I think was red.. I already have a toga white/red int so was looking for something I could do the red int with..
also seems that depending on year, sticker manufacturer, etc sometimes the first letter was not caps, sometimes all letters were caps, sometimes all bold, sometimes none bold, silver sticker or silver metallic! I make many too, and always hear about it!